Sweet, little Bucky was a very handsome gentleman dwarf, Dutch X bunny who originally came from San Francisco Animal Care and Control a few years ago. He had a severe malocclusion and needed rescue and regular dental care. Bucky found his "tooth fairy" and guardian with Chris, who loved him dearly. 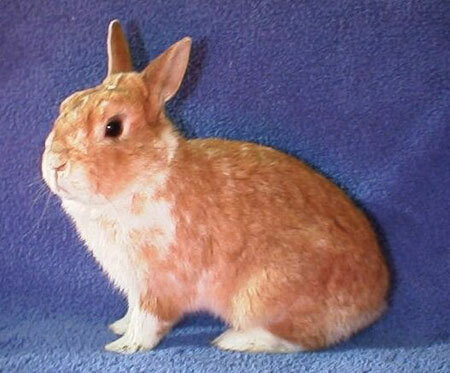 Bucky would delight Chris with his bunny dances and sweet and gentle personality. Bucky was Chris's special little man. Though it was tough to "share" him, Chris decided after a while that Bucky wanted a little girlfriend. Soon Bucky met and fell into bunny love with Mia, a sweet, tiny, spayed dwarf girl. Bucky and Mia were always snuggling together and tenderly grooming each other. It is with great sadness that we share the loss of Bucky who died during dental surgery to remove his teeth. The intention was to provide him with greater comfort and minimize the monthly stress of tooth trims. Bucky's little heart gave out during surgery and he never awoke from anesthesia. Bucky, we all loved you very much and will miss you more than you could ever know.